This beautiful single house is located in Cranberry Crossing, an idyllic village of Mediterranean-style homes nestled along the 13th and 14th fairways of Fiddler Creek's Championship Golf Course. Our home has over 2000 square feet of living space, plus a large, screened lanai and private pool. It is tastefully but comfortably furnished. It has a tiled kitchen with granite counter-tops. All of the essentials have been carefully chosen for you from linens to a fully-equipped laundry room. There is a two-car garage and outside parking. Fiddler's Creek has a 54,000-square-foot club and spa that caters to every indulgence. Spa services include massages, facials, and full-day spa packages. The fitness facilities provide spinning, yoga, body sculpting, water aerobics, interval training, and Pilates classes (classes are priced separately), in addition to thousands of square feet of cardiovascular and weight-training equipment which can be used on an individual basis or with the assistance of on-site personal trainers. Outside, the club and spa's centerpiece is a multi-pool lagoon complex with waterfalls, slides, a gazebo-shaded whirlpool, a children's pool, and a 400-foot boardwalk overlooking Fiddler's Creek lake. Pool-side beverage, towel, and sun lotion service is, of course, available, as is al fresco dining at the outdoor terrace. The adjoining tennis complex has professional instructors on staff. Membership Transfer ($500) to tenant required to ensure use of all spa amenities. Tennis and golf are not included in the transfer fee. Golf is available at the Marriott course on a pay per play basis. Tennis is also available on a pay per play basis. Haute cuisine can be had at Caxambas, the new restaurant located inside the club and spa. Caxambas captures the 'Great Gatsby' era of the 1920s, having been modeled after the grand hotels and private clubs of the period. Executive chef Kenneth Gilbert, formerly of the Ritz-Carlton, Amelia Island, has created a spectacular series of menus for the restaurant. Health and cooking seminars, arts and crafts classes, educational seminars, trips to the Naples Philharmonic Center for the Arts, sports outings, guided nature tours, wine tastings, themed parties, group travel, excursions to Key West and the Everglades, and fashion shows are all regular events organized at the club and spa as well. Fiddler's Creek is minutes from world-class shopping - from outlet malls to Naples' famous Third Street South and Fifth Avenue South shopping district in the heart of Old Naples. It is less than five miles to the beaches at both Naples and Marco Island, including pristine Tigertail Beach. Should you wish to go fishing, or simply take a boat out among the 10,000 islands, the Intercoastal Waterway is less than two miles away, and the Isle of Capri, with its full-service marina and charter fishing opportunities, is barely three miles away. We furnished the home in a way that we would enjoy, feel comfortable in and feel proud to own. I would love to share this beautiful home with you until I have more time to spend there myself. Warm climate; lovely natural setting and wonderful spa. Near the everglades and near the wonderful old town of Naples. Comfortable, well appointed home. Warm climate; lovely natural setting and wonderful spa. This is a very lovely home, large / spacious rooms, and a beautiful screened in lanai with swimming pool. The master suite is nice, as well as the eating area and open kitchen. Our favorite pass time was watching the Osprey dive in the pond behind the house for their morning and evening meals. Close to the club house, easy walk or short drive. The owner was easy to talk to, and accessible. I'd love to go back for another month. All amenities were provided and everything worked well. Easy and comfortable house. This home is so comfortable with sunrise views and calm all day long overlooking a creek and lovely vegetation. The home is well equipped and easy to relax in. The club and spa are top notch and well worth the extra fees. Beautiful home in a great area!! Sunrises and the moon at night from the lanai - breathtaking!! We have rented in Fiddlers Creek for 7 consecutive years & before that a Marco Island Home with pool.This was by far the nicest Home. We can not believe the One Negative Review. Fiddlers is like living in a Resort only with the Peaceful tranquility of a Single Family Home. We did not do the $500 Transfer to gain Club Membership this year do to our limited 17 Day Stay. That Fee is a bargain if you stay a Month or More. Full Access to the Fitness Center, Happy Hour Discounts @ Gator Grill, etc. Some folks are just naturally negative people & would complain if they were "Hung with a New Rope". (A phrase my dad taught me). Fay was very easy to work with & very Attentive. She advised us of the Additional Heating Cost for the Pool in advance & we did not use it. If we had I would have completely understood. Her Home is Beautiful, Comfortable & if I were her I'd be tickled to death if "New Construction" was going on in the Distance . We always visit the various Builder "Open Houses" . We would rent here again in a heartbeat!!! This couple was wonderful to work with and appreciated my home. Thank you to them. The point of my review is to tell what you cannot see in the ad. Yes, the bones of the house are nice and the neighborhood is lovely. That is obvious. But the condition of the house does not match the neighborhood- furnishings past their useful lives; no chaise lounges for the pool area; no usable grill; no dining table in the house(tiny uncomfortable metal breakfast table); horrible beds; couch and chairs that you fall out of because they are so worn down. And the house now backs to a construction zone- construction earthmovers begin operations at 6am 6 days a week. It is loud and dusty so you cannot sleep nor enjoy the pool area! In addition, this neighborhood is layered by exclusive memberships. Do not expect to actually use the amenities listed in the rental ad because the owners do not belong to anything and the clubs are not condusive to renters. You will need to golf elsewhere, play tennis elsewhere, use the public beaches. We paid $500 to transfer the pool/health club membership only to find out all exercise classes are extra fees and the pool is at full capacity so getting a chair is a competitive event! One other note, the owners do not heat the pool(it was 64 degrees when we arrived) and have a fine print clause in the lease upcharging you for usage of electricity of any sort. The allowable power is barely enough to turn on lights. The owner also nickle and dimed our security deposit. She actually charged us for leaving a bar of soap in a soap dish! So, buyer beware. These are not nice people. They were combative and rude at every point. They are 100% profiteers and your enjoyment of their house is absolutely not important. We have rented from VRBO for years and in many countries. We have NEVER had an experience like this so we weren't prepared for the horrible experience. 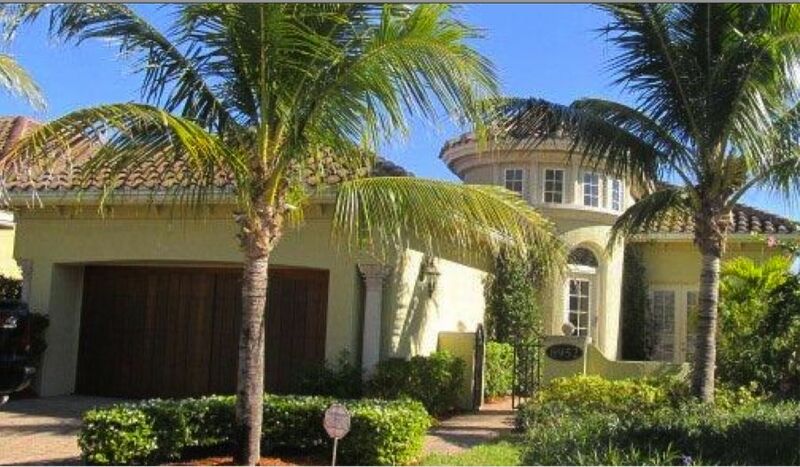 There are lots of nice houses in Naples, go rent one of the other ones! This reviewer clearly has an axe to grind and is in a minority compared with the positive reviewers. Her statements are petty and unkind, and largely unfair and unwarranted. I treat all renters courteously and fairly. If anyone was combative and rude, it was this renter. The furniture is in good condition and comfortable, and has been enjoyed by our previous renters. I am happy to send pictures of all the furniture and amenities. There were several misunderstandings regarding inclusions, which the reviewer has chosen to fully blame on the owner. The renters did not pay the $500 for the spa transfer. I made a mistake in the total rent numerical part of the calculation by omitting the transfer fee -- the words in the lease had the correct total, but the numbers did not. As it was my mistake, I didn't ask for additional payment. The description on the web site states that golf & tennis are not included in the spa transfer, which this renter failed to notice. When we realized there was a misunderstanding of these services, I offered to release the renter from the lease & to provide full reimbursement of rent & deposit. The renter declined this offer. In addition when the renter was seeking the rental, it was stated that there would be 2 adults, no children; that also didn't turn out to be correct as, in addition to the 2 adults, there were 3 older children occupying the property. Deductions from the security deposit are clearly & prominently provided for in the lease, not in "fine print". One of the deductions is for amounts for utilities above the average monthly amount. Otherwise, renters have a tendency to leave the pool heater on constantly, leaving me with hundreds of dollars of utility bills over the normal usage. In addition, a cleaning cost is included. If the cleaning is more than this charge, the amount is also deducted from the rental. The cleaner outlined all the items she cleaned & due to the actions of the occupants the charge was $65 more than what was included in the original fee. The near-by construction activities commence at 7-7:30 am, not 6 am. The work can only actually be heard during limited times. In our several recent stays there has been no dust problem at all. There have been virtually no negative effects on pool enjoyment. No other renters have complained about any aspect of the construction. I am confident that, like virtually reasonable people who take the time to read the lease, will thoroughly enjoy the property. Golf and tennis are available on property, but are priced separately at the club.